This ceramic switch plate is completely handmade and fired at high temperatures to give its hardness. It will fit a standard toggle-GFI combo plate size. This particular design is painted in an intense yellow background with colorful foreground motifs, but the predominant color is very yellow. Actually, most of the Talavera ceramic items are painted first hand with white, then on top of the white the foreground decoration is drawn on top of it. For a hacienda, country or South-Western style this switch will make a unique accent into your place. 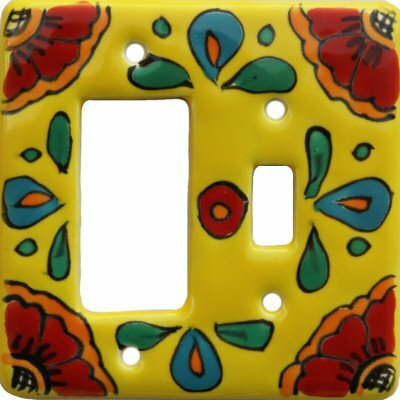 All of our Talavera Mexican switch plates come with ivory-painted head screws.